Three years ago we put a fence along much of the east and south property lines. We used barbed wire because it's a) cheap, b) readily available, and c) easy to install. What I didn't fully consider was what the salt in the air would do to the wire. Along all of the eastern fence line, and much of the southern, the salt has dissolved the galvanized wire: the fence is gone. By now, though, people heading to the beach from the pier act as though the wire is still there and don't trespass so the missing wire's not too important. I knew when we installed the fence that strands of wire - even barbed wire - weren't going to keep people off the property. At the most the fencing just marked the lines. But there was still the issue of short-cuts across the property that were resulting in worn pathways that look like stripes across the emerging grass and through landscape plantings. So additional fencing was in order. 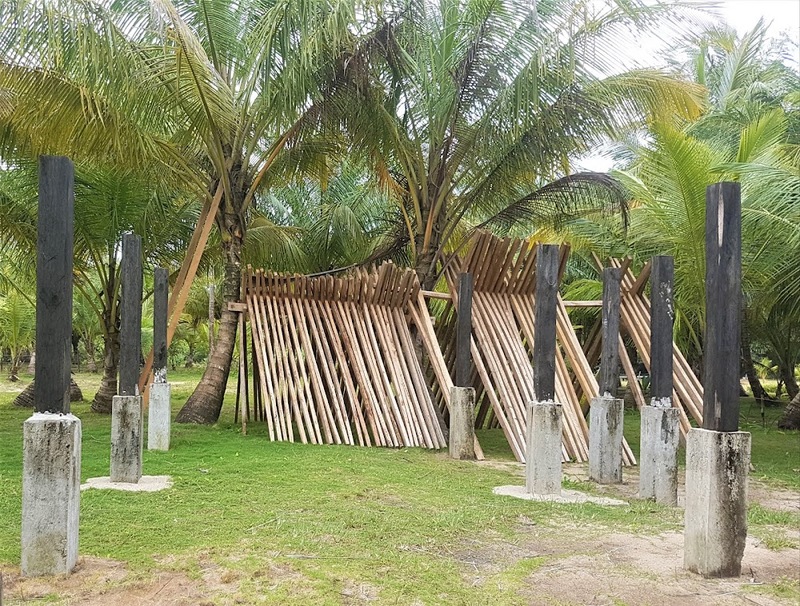 This time though we needed a fence that went from the pier all the way across the cleared section of the property in front of the house, in line with some of the coconut trees we've planted...about 200 meters' worth. We just had to figure out a fence with a minimum visual impact and no metal. We ended up setting short posts about twelve feet apart: one post between each pair of coconut trees. Tied to, and between, each post is a pole, about as big around as a fishing pole. The poles are at waist height, nearly at the top of each of the posts: too high to step over unless you're about seven feet tall; too low to get under unless you crawl. Much lower impact all round.